amsin comes towards Sumitra and all of them and touches the trap from which all of them are trapped. Tamsin says that it is not hurting her and she removes all of them from the trap. Tamsin says Alek to save Hukum from a simple water bucket. Tamsin asks Sumitra and Rohini to leave. Alek throws water on Hukum and Hukum gets normal. Hukum gets up and hits Mahir. Hukum starts hitting everyone and Tamsin looks at all this. 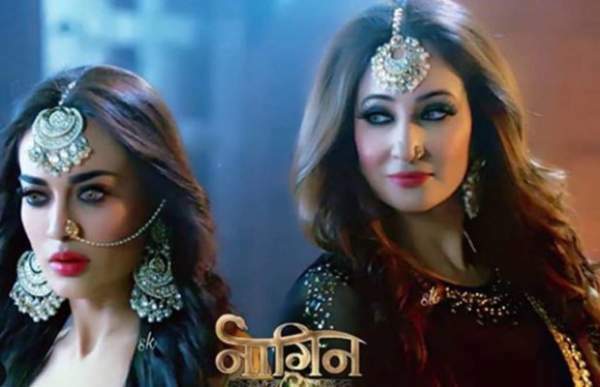 Hukum moves forward towards Bela and Bela comes in her Naagin avatar. Alek and Rohini hit Kuhu and Bultu. Sumitra comes to fight with Vish. Bela hits Hukum saying that she won’t let him defeat her. Vish comes in her Naagin avatar and hits Sumitra. Hukum hits Mahir again and again. Vikrant bites Alek and Vish bites Sumitra. Kuhu traps Rohini and Rohin falls down. Bela throws Hukum on the Abhimantrit Sindoor. Bela and everyone take Tamsin with them. Hukum wakes up and asks them to stop. Baba is conducting a pooja at Haveli and calls all the Lord Shiv devotees. All the Naag and Nagin’s come there and Baba asks them to stay alert for fighting with Andhaka. Hukum asks Bela to give back her Tamsin. Vish, Vikrant, and Bela come in their Naagin avatar to fight with Hukum. Hukum throws Vish, Vikrant, Mahir, and everyone. Hukum hits Bela and she falls down. Tamsin pushes a car towards Hukum to trap him. Hukum gets stuck to the tree and Tamsin pushes the car to trap him. Tamsin hits Hukum with her magical powers. Hukum flew away in the air. Vish comes and asks Tamsin that she is alright. Tamsin says that she wants to go on a ride and all of them take her. Sumitra, Alek, and Rohini are shocked to see this. Tamsin comes to the Haveli and looks at all the people over there. Bela and everyone also come with her. Baba starts all the mantras and Bela says that she wants to talk with Tamsin. Bela says to Tamsin that she has a Shaitaan hidden in her which is not a wrong thing. Bela says that good power helps us to do good things. Vish says that they have done this to help her. Bela says that it is important for Tamsin to become powerful for goodness. Bela asks Tamsin to support them for doing this. Sumitra is worried about everything that she hasn’t got anything. Sumitra says that she is not getting to understand Tamsin. Alek says that they need to take ahead of their plan without Hukum. Rohini says that they should not talk bad about Hukum. Alek says that they might be in the Haveli so he has a good plan for it. Tamsin says that he wants to play. Baba denies it which makes Tamsin angry. Tamsin starts running from there and asks them to catch her. Tamsin runs like wind and no one could see her. Baba asks everyone to catch her. Tamsin breaks all the things and places in Haveli and no one could catch her. Bela looks at Tamsin hiding at a place. Bela calls Vish quietly and informs Mahir and Vikrant also. Bela catches Tamsin and says that they have won. Tamsin says that no one could defeat her. Vikrant looks at the Baba and the Naag who have lost their senses. Tamsin says that she had made these people out as they were denying her to play. Alek makes a plan to go inside the Haveli with Sumitra and Rohini. Bela and everyone look at Tamsin. Vikrant shouts at her that she has killed their Baba. Tamsin comes in her Shaitaan avatar and tries to hit Vikrant. Tamsin breaks the Haveli and everyone starts falling. Alek brings Kerosene oil to kill Bela and everyone. Rohini says that it can also hurt Tamsin. Sumitra says that she is Hukum’s daughter and nothing could hurt her. Vish tries to stop Tamsin, but she hits her back. Tamsin starts running from the place. Tamsin says to them that the one who runs from here can save his or her life. Tamsin is happy after seeing all the destruction. Bela asks Tamsin to stop all this but she doesn’t agree with her. Bela and everyone leave from there and Tamsin start finding them. Vish and Vikrant trap Tamsin with a rope. Tamsin promises them that she will not hurt anyone. Tamsin calls Vish as her mother and asks to leave her as she is not able to breathe. Vish gets emotional and asks all of them to leave her. Bela says that she is just making an innocent face and they are doing all this just for her sake. Bela says that she will perform all the rituals as Aghori Baba is not there. Bela and everyone take Tamsin to the Hawan Kund. Sumitra, Rohin, and Alek cover Haveli from the Kerosene oil. Sumitra burns the matchstick and throws it ahead. The Haveli catches fire and starts burning. All of them are happy to see it. Precap: Bela is performing the rituals for Tamsin. Vish asks Bela to conduct everything carefully which doesn’t hurt Tamsin. Tamsin gets to fall down and Vish gets emotional for her!